Every season, in comes a dress deemed so spectacular, it sells out on command. Last year, it was the 'Coco' sequin dress, a multi-coloured midi dress with a gradient effect allowing four shades to effortlessly assimilate into one standout number. You would be hard pressed to see at least one summer wedding where this wasn't the dress of choice and over time, it became the go-to gúna for Irish women on the red carpet and in real life, attracting blogger Niamh Cullen and actress Michele McGrath. But, like all good things is must come to an end. 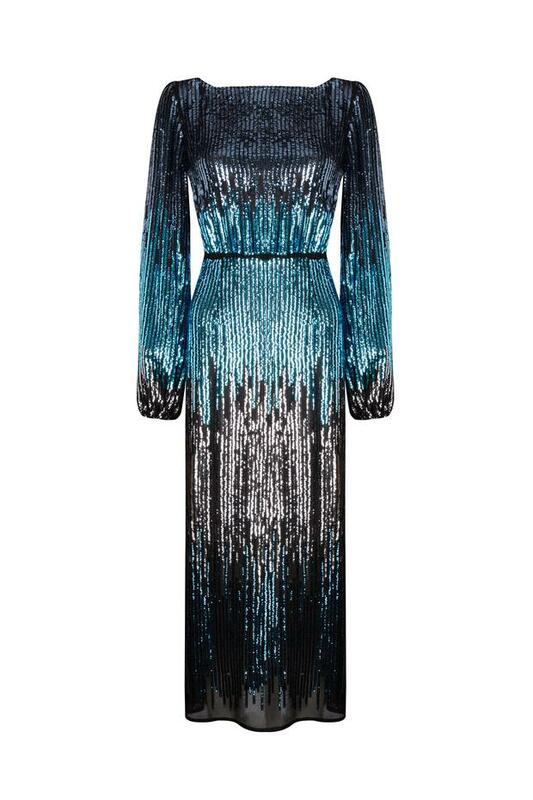 And so, enters the 'Coco' ombre sequin dress. A navy blue and cerulean combination with a hint of silver merged together for provide the modern woman's version of dressing for Studio 54. The dress, which retails for €420 at Brown Thomas, sits comfortably a step above high street and a step below premium dress, which mean's it's in the right price range to infiltrate your Instagram feed this season. The price point for all of the brand's piece was much of the impetus behind its launch, according to founders Henrietta Rix and Orlagh McCloskey, two former ASOS buyers who set up the London-based label in 2015. “When we started Rixo, the contemporary brands we were seeing in the big department stores were very minimalist and monochrome," Henrietta told industry magazine Drapers earlier this year. "You could be paying hundreds of pounds for a simple logo T-shirt and the materials were often polyester. We thought, ‘You know, if you could make something beautiful in silk, at around a £300 price point, people would buy it.’"